...to keep their guns secure. It's safe enough in the garage. Not. Just edited the title and stickified it. I know my air guns aren't locked up as I dont have a gun safe BUT my amunition is and there are no kids in the house, leaving a loaded gun in reach of children is very foolish, that said my sympathy is with the family, even the Father as its all to easy to become complacent with air weapons. what a tragedy - and a very apt reminder to everyone with guns or airguns ..
You don't need to secure air weapons by law, but there's a good cheap way to do so without needing the fuss and expense of a steel cabinet required for rifles and shotguns. 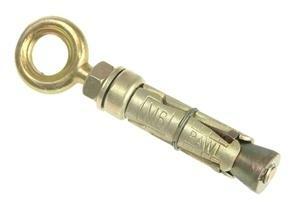 can be fitted to a solid brick, block or stone wall with ease - all you need is a drill - and then you can use a short chain and padlock to secure the gun to it. Make sure the chain goes around the weapon and through the trigger guard. You can also purchase trigger locks for about a fiver to a tenner from any reputable gun shop, or online, that prevent the trigger being accessed by unauthorised users. I will certainly look into the wall eyes and visit the gun shop for the trigger guards. The amunition is in a small fireproof safe in a seperte room so loading and using them is a very deliberate job. Wait... sorry, whats everyone on about? You said my sympathies r with the family... something I missed? Click on the green lettering in Brown Bears's original post. It is a link to a news article. I assume that the kid didn't know it was loaded. Parents should teach their kids about that kind of hazard. Leaving a loaded gun anywhere seems pretty stupid to me. That's the point really. No malice, just a moment of thoughtlessness and then a dreadful tragedy. It really is worthwhile to go through all your gun and ammunition storage from time to time, audit it for how safe it is, also consider things like hunting knives and open razors, things that fascinate children. Even when children can handle guns safely, they still haven't learned when to take 'em out and when to leave 'em in. Is it me or is everyone round here welsh?